Distance - The hotel is about 500 m far away from Piazza dei Maronti and can be easily reached on foot from the beach. The luggage is collected upon arrival by the hotel personnel directly in the square. How to reach the hotel - By plane: if you arrive by plane at the Napoli Capodichino airport, you can reach the Beverello dock (and take Lauro or Caremar ferries and hydrofoils), the Mergellina terminal (and take Lauro hydrofoils) or the Pozzuoli port (and take Pozzuoli or Caremar ferries) by bus or taxi. By train: main railway stations in Naples: Central-Piazza Garibaldi station and Napoli-Mergellina station. If you arrive at the Central station, go to the Beverello dock, which is about 2 km far away, by taxi, bus or tram, which can all be taken in front of the station. If you arrive at the Mergellina station, go to the Mergellina port nearby where, however, you can take only hydrofoils. 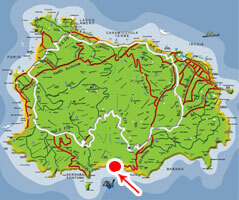 Once reached the port of Ischia, take the bus no. 5 heading for Maronti or a taxi or a microtaxi to reach Piazza dei Maronti, which is located in the Municipality of Barano.